If you read my previous post then you know it has been a while since I last visited Disneyland Paris and it has changed so much since my last trip. Next month I will be heading to Disneyland Paris with my best friend for 4 nights and 5 days. As it is my friends first trip to Disney and it has been so long since I last visited, we both want to get so much done during our visit! I have put together a list of the main things that I would like to do whilst we are there. 1. Experience Disney through a first-timers eyes – I am going to Disney with my best friend who has never been before so I am looking forward to watching her experience Disney for the first time. 2. Go on all the rides – There are still plenty of rides I haven’t been on before because I didn’t like big rides when I was younger. I think its great that there is still quite a lot that we will both experience for the first time whilst we are there. Hopefully over the duration of the trip we will be able to go on all the rides, except one of my personal favourites Pirates of the Caribbean because it will be closed when we are there. 3. Meet the main characters (Mickey, Minnie, Pluto, Goofy, Donald, Daisy and Chip & Dale) – I know we are going to be extremely lucky if we manage to meet all these characters but hopefully we can meet most of them. I will class this as a success as long as we get to meet at least 4 out of the 8. 4. Have a character breakfast at Plaza Gardens – I have done character breakfast before and they are a great experience. You get to meet a range of characters and have great interactions. Also, who doesn’t love a Disney breakfast buffet. 5. Go on the PanoraMagique Hot Air Ballon – This is something I have always wanted to do both in DLP and WDW so hopefully this trip I will finally get the chance. I have watched a few videos on YouTube and the views look absolutely amazing! 6. Watch the Princess Waltz and Mickey and the Magician – I of course want to see all of the shows but in particular I’d love to see the Princess Waltz and Mickey and the Magician. I have seen some beautiful photographs from the Princess Waltz so I would really like to try and get a good spot so I can enjoy the show and hopefully get some good photographs to share. Mickey and the Magician looks absolutely amazing and I think it will end up being a highlight of the trip. 8. Buy a 25th Anniversary Pin and a Santa Fe pin – I love pins so I know I will buy a few whilst I am there but I specifically would like one that represents the anniversary. I also have pins from the hotels I have stayed at in Disney so I would like to carry on the traditional and buy one for the Santa Fe where we are staying this trip. 9. 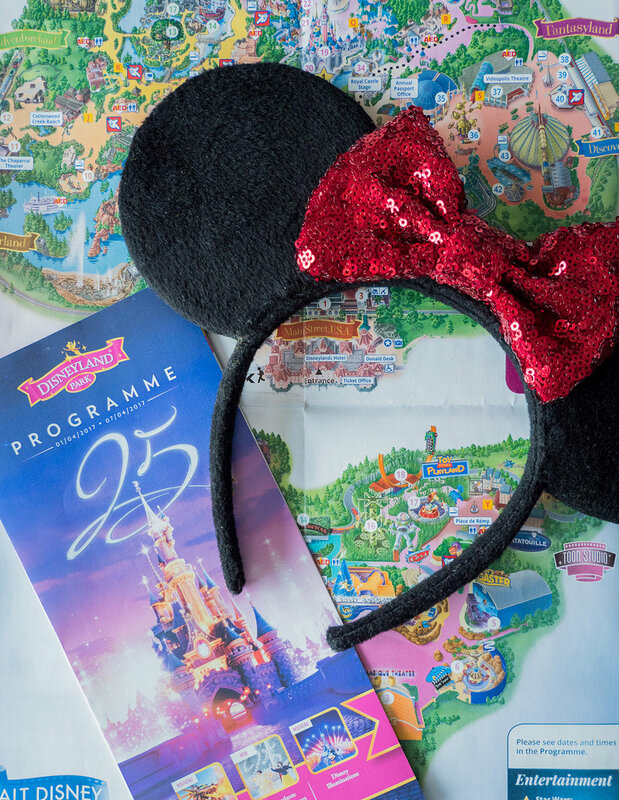 Wear Minnie Ears everyday – Now this might seem like a bit of an obvious thing to do when in Disney but in all my trips to Disney I have not once worn Minnie Ears. I have tried them on and found them uncomfortable so never bought any. A few months ago Primark brought out Minnie Ears and they are so much more comfortable and I love them so I can’t wait to wear them in the parks! Since my last trip I also discovered some amazing custom made ears from Etsy and I recently ordered some so I am not-so-patiently waiting for those to arrive before the trip! 10. Buy a balloon – I can’t decide which balloon I want to buy but I’m thinking either Mickey, Minnie or Winnie the Pooh. I’m not going to lie the whole reason I want a balloon is for Instagram photos. Saving the must do’s until last! 11 – Watch the parade – I can. not. wait. to see the parade. I hope we managed to watch the parade a few times whilst we are there because I am sure it will be amazing. 12 – Watch Illuminations – Whilst I am disappointed that I missed Disney Dreams! I am looking forward to seeing what Illuminations has in store. I haven’t seen any video footage of the fireworks and I am hoping I can keep it that way till our first time watching them in Disneyland Park. 13. Be the last on Main Street – This one will all depend on how tired we are! We shall see whether we can survive magic hours, Illuminations and then waiting to be the last on Main Street! As you can tell I still hope we can get so much done in our short time in Disneyland Paris. I will post an update when I get back of how many things I managed to tick off the list.